The nights are lengthening, the tree buds are getting bigger and the weeds are starting to take control again. With winter in decline, the motivation and need to get out into the garden returns with a bang and more often than not, we schedule a Saturday and blitz it. Your back and shoulders are woken from their winter retreat with quite a shock. They have been ticking over through Christmas, doing less than normal, and then suddenly 5 or 6 hours of hard labour ensues. The result of this is backache and needless pain. 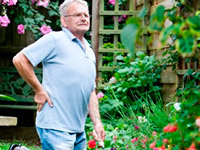 Here is how our Physios suggest you avoid “The Gardener’s Back”. Vary your tasks for variation of posture. So try not to dig all day, as you will be constantly bent over, making your back work throughout. Choose some standing or pruning tasks as well, and change every 20-30 minutes between them. This gives your back micro-breaks and time to recover. Also have a 5 minute break every hour or so – a quick cuppa or a review of your good work. This rest will also help to let your back recover before getting back to it. Take this simple advice and you should see less chance of experiencing “The Gardener’s Back”!